Uttering Hills Cave is a cave occupied by bandits, in the mountains to the west of Windhelm. It has only one interior zone: Uttering Hills Cave. It can only be reached from directly north or south. The easiest is to travel to Anga's Mill, cross the river and climb the path. Outside the cave is a small bandit camp, with two bandits guarding the entrance; one archer and one melee fighter. There are two small tents, both containing unowned bed rolls and a few barrels and sacks of food around the tents and in front, an old campfire with a metal pot containing an ingredient hanging over it. A number of snowberry bushes are in the vicinity and a wooden door marking the entrance to the caves to the northwest. The entrance leads into an icy tunnel that descends to the north, passing a small table with a random poison and a random mace. The mined area turns into snowy cave tunnels and has a few corners. Just before the tunnel opens out into a chamber there is a mammoth tusk on the ground beside some mammoth ribs. The path diverges into two paths to the left and right, both patrolled by a single leveled bandit. Following either tunnel leads to two leveled bandits warming themselves by a campfire with a cooking pot hanging over it. There is an unlocked chest beside this, a wood chopping block to the southwest and a corundum ore vein to the west. There is also a wooden door to the north that leads to a circular tower room with stairs descending, at the bottom of which is a table with an alchemy lab built-in and beside this a random potion. Hanging above the lab is a bunch of dried elves ear, a bunch of dried frost mirriam and two pheasants. A leveled bandit is patrolling between the room and the next stairs, and another one sitting at the far end of the passage below. To the left of the passage is an adept locked chest. At the far end of the passage there are three small cells that can be opened with pull chains, but these never seem to contain prisoners. Partway along the passage there is a room on the right containing a long wooden table in the middle with a cabbage, some bread and some cheese on top. Two barrels in the southeast corner, one containing ingredients, the other foodstuffs. To the left, against the west wall is a set of shelves holding many more pieces of cheese. There are wooden doors on both the east and west walls. To the north, during the related quest, there is a Summerset Shadow banner hanging from the ceiling by the north wall that can be burnt (see the quest page for details). The room to the west contains up to two bandits; one awake and one sleeping. There are also four unowned single beds; two coming out from the north wall and two from the south wall and two sets of shelves against the west wall holding several bottles of alto wine, a salt pile, a knapsack and a leveled invisibility potion. The other room, to the east contains the bandit chief, along with an unowned single bed coming out from the east wall. Opposite this is a set of shelves holding six common books, an iron dagger and a copy of the One-handed skill book Mace Etiquette. While against the south wall is a tall wardrobe containing clothes and an unlocked boss level chest to the right. 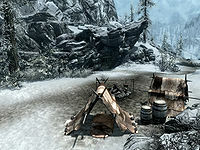 In order to mark this location as cleared, the bandit chief must be killed prior to starting the Thieves Guild reputation quest for Windhelm. A gold ore vein and a corundum ore vein are to the east (underneath a flag, near a frost troll's lair). An iron ore vein is slightly southwest. After the quest Summerset Shadows, members of the Summerset Shadows replace the bandits and follow the bandits' routines. If you have an objective to kill the bandit leader here after the quest, it will be impossible to complete it as the bandit leader will be the corpse of Linwe, who is already dead. This can be fixed by resurrecting Linwe with the console by targeting his corpse and typing resurrect 1 and killing him again.